Winter isn’t traditionally the time that campers flock to the great outdoors–especially for Ohioans. With high average winds and temperatures consistently dropping 20 or below, the gifts offered by the season of bare trees and waning light often go ignored, unless you bundle up and brave the cold. 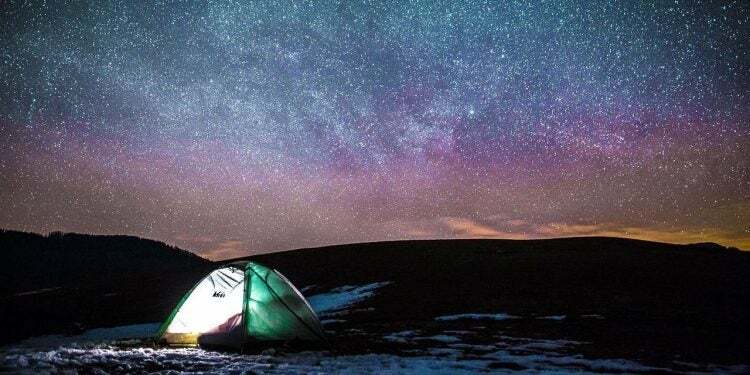 Luckily, there are plenty of cool camping cabins in Ohio that provide shelter from the Midwest’s winter weather and make great winter camping destinations when you’re itching for a cozy and outdoorsy weekend adventure. To help you find the perfect camping cabin, The Dyrt has rounded up five of the best across the Buckeye State. Now all you’ve got to do is gather your friends, load up your winter camping gear, make your plans, and go have some fun in the snow. 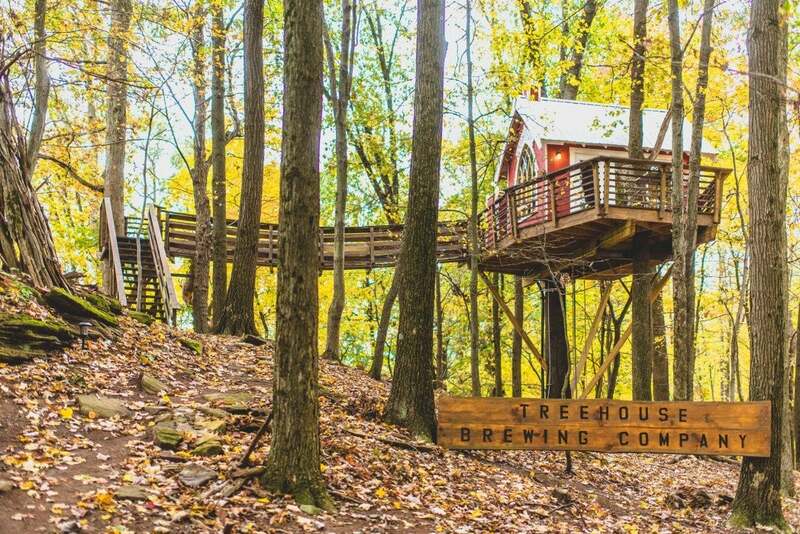 The owners of The Mohicans—a cabin and event center in Glenmont, Ohio—take camping cabins to a whole new level with six amazing and authentic treehouses, two of which were designed by famed treehouse designer and TV personality Pete Nelson. The treehouses, with whimsical names like the Little Red Treehouse and the Moonlight Treehouse, are impeccably crafted and feature various amenities like sleeping lofts, fully stocked kitchens for cooking, and private decks. The Mohicans also has four on-the-ground but equally cool cabins. 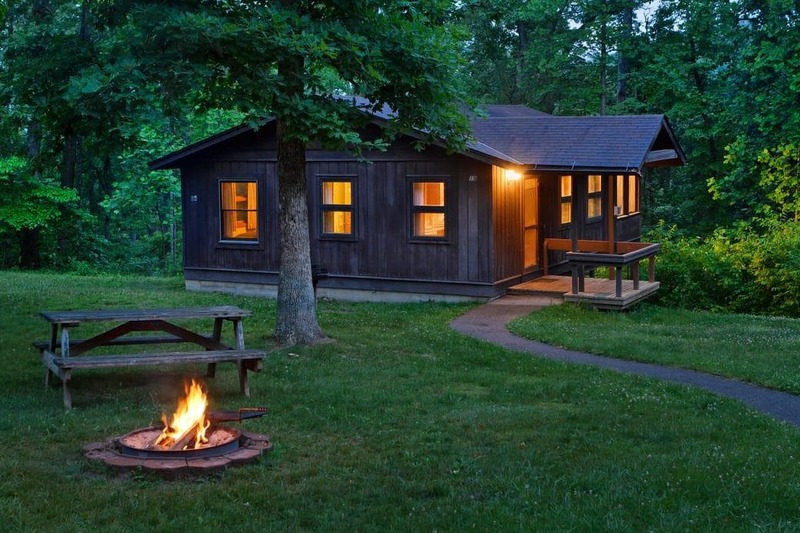 These Ohio camping cabins can sleep larger numbers of people—both the Mohican and the Walhonding have four bedrooms each—and are true luxury cabins featuring comfortable sitting rooms, large fireplaces and, in some cases, a king-sized bed. The Mohicans cabins and treehouses are a quick 15-minute drive to Mohican State Park, which offers a wide range of outdoor activities like hiking, mountain biking and picnicking. Runners, walkers and equestrians will enjoy the Mohican Valley Trail, a 4.5-mile all-purpose trail that’s just a 15-minute drive from the cabins. Located in southeastern Ohio’s scenic Hocking Hills, At Boulder’s Edge Cabin and Tipi Retreat offers guests three authentic log cabins, a lodge that sleeps 10, and tipi camping for anyone looking for a rare experience under the stars. Tucked away in a white pine forest, the pet-friendly and handicap-accessible cabins (depending on the cabin, check the website for details) come with fully stocked kitchens, hot tubs and hammocks, just to a name a few of the amenities. The tipis can hold up to 10 guests and are available year-round—don’t worry winter campers, every tipi has a wood stove inside to keep you warm. Just outside of the tipi is a fire ring for roasting marshmallows and hanging with friends and family. No matter where you choose to sleep at At Boulder’s Edge you’ll find some of the best camping cabins in Ohio. There’s so much to do on-site at At Boulder’s Edge that you won’t have to look far for a fun outdoor adventure. 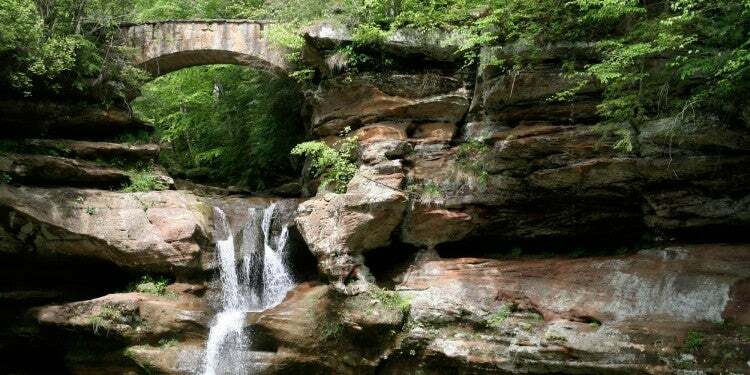 One of the biggest draws of the property is its easy access to Natural Bridge and waterfall, one of the Hocking Hills’ best natural attractions, reachable via a quick hike from your cabin or tipi. The Hocking Hills region—also known as Ohio’s southeastern playground—is a great place to go rock climbing or rappelling. High Rock Adventures offers visitors the chance to do both and they also have off-the-beaten-path options like night rappelling. They also offer guided tours led by an experience guide that will help you become familiar with the impressive natural features of the area. 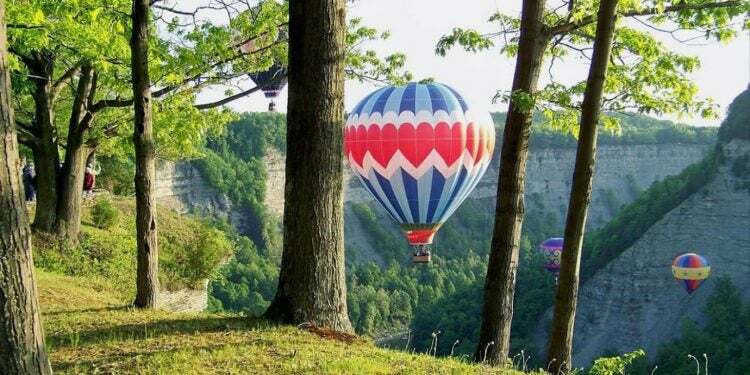 There are also a number of stunning hikes in the area that lead to waterfalls, caves and famous rock formations such as Old Mans Cave, Conkles Hollow, Cantwell Cliffs, and Cedar Falls. 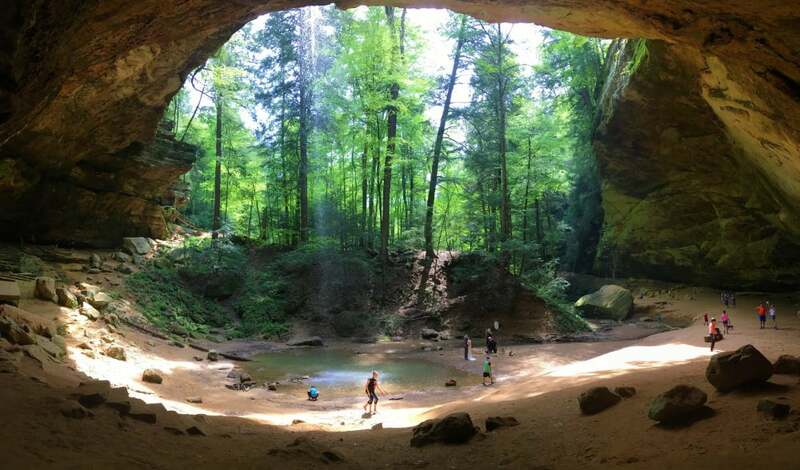 Ash Cave in nearby Hocking Hills State Park // Image from The Dyrt camper Resa B. Another destination with impressive camping cabins in Ohio’s Hocking Hills, Top O’ The Caves is a 60-acre resort offering deluxe log cabins with fireplaces, basic log cabins, and a lodge that can accommodate large groups. The lodge has four bedrooms with eight full beds and two twin beds, sleeping 20 people total. It also features three bathrooms and a Jacuzzi tub, a fully stocked kitchen, a full sized dining room and living room with a fireplace. Its large but cozy feel makes this one of the best winter camping cabins in Ohio for large groups. The resort also features four fully-equipped cabins and three rustic camping cabins. The fully equipped cabins all have bedroom linens provided, a stocked kitchen, bathrooms, heat, and a fun outdoor space where your group can hang around the fire on a cold winter’s day. The rustic cabins are all furnished with hand made furniture. Each cabin is equipped with a refrigerator, microwave and heater but take note that the rustic cabins do not have running water or include linens. The main bathhouse is about 50 feet away. There’s a lot to do at Top O’ The Caves. The property features a fishing pond, a playground and a swimming pool that can be used in the warmer months, and a game arcade—for when it’s just too cold to do anything outside. A short walk in the woods leads to the Buckeye Trail, which takes hikers to Ash Cave, Cedar Falls and Old Mans Cave. 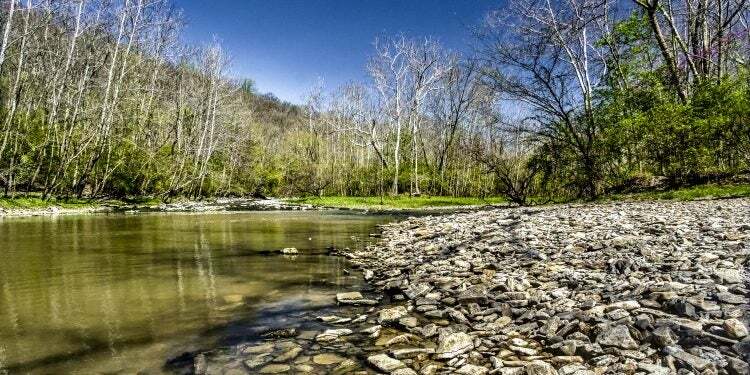 The Buckeye Trail is Ohio’s longest trail and and loops around the entire state, so hikers can conceivably walk for miles and miles on the trial. Venturing away from these Ohio camping cabins, Top O’ The Caves is centrally located to all of the best that the Hocking Hills have to offer. Just like at the At Boulder’s Edge resort mentioned above, there are a plethora of hiking trails, rock climbing and rappelling adventures, and horseback riding opportunities nearby. If you like shopping at funky little boutiques or drinking great craft beer, take an afternoon and head over to the campus of Ohio University in nearby Athens. You’ll find lots of great shopping on Court Street and locals report that a beer from Jackie O’s Pub and Brewery and a meal at Casa Nueva shouldn’t be missed. Image from The Dyrt camper Lauri C.
Burr Oak State Park Lodge is one of the most popular centers in southeastern Ohio to host a wedding or a conference. 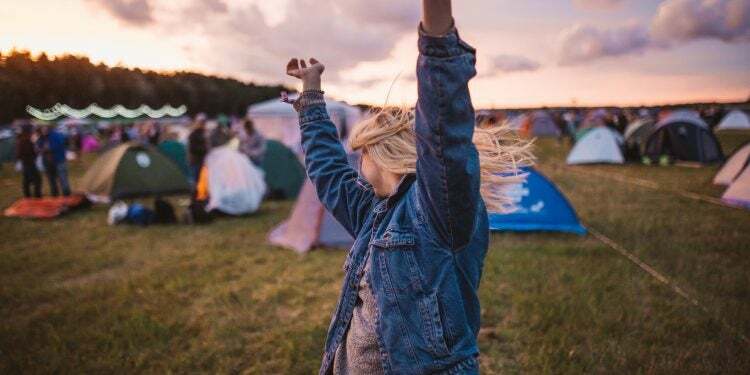 Because of these notably indoor events, many people don’t know that Burr Oak Lodge also offers some of the best camping cabins in Ohio for smaller groups looking to escape into nature for the weekend. 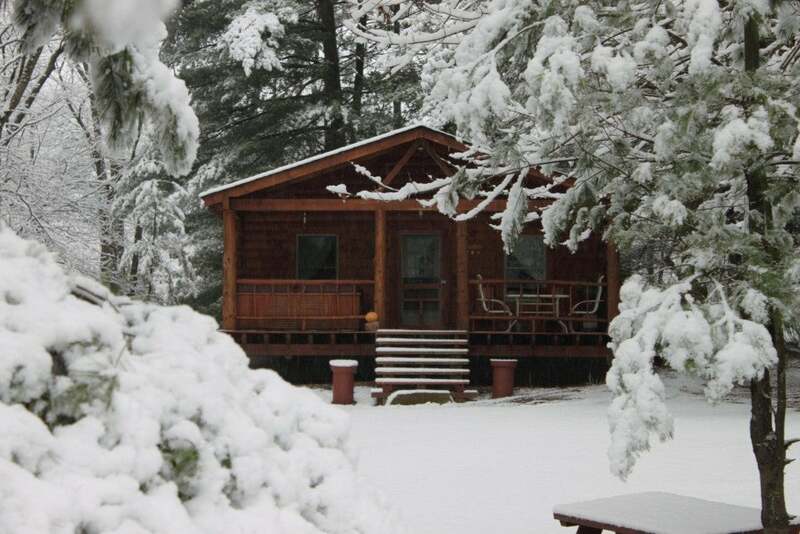 In addition to the main lodge, the resort offers 30 cozy cabins nestled around 664-acre Burr Oak Lake. There are 22 standard cabins available to rent and 8 deluxe cabins. The standard cabins have two bedrooms and can comfortably sleep five people, and four of the cabins are pet friendly. The deluxe cabins can sleep eight people, and are located closest to the main lodge. 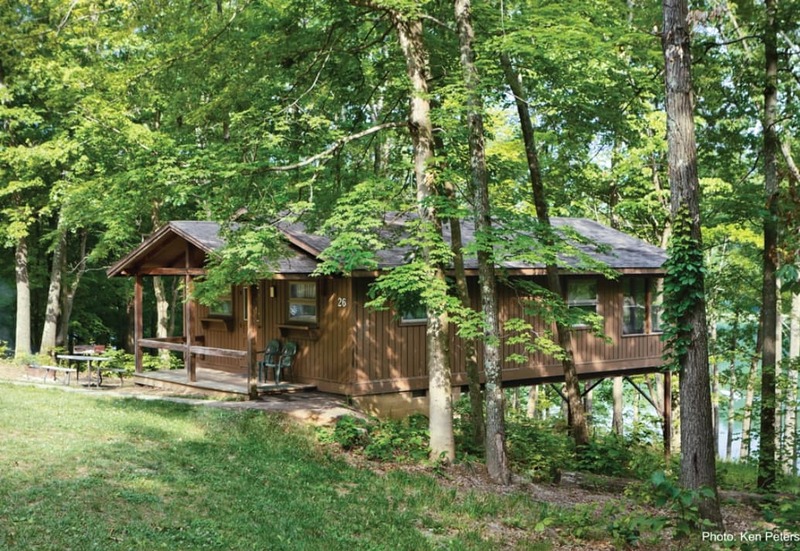 All of the cabins have a fully furnished kitchen, a screened-in porch, charcoal grill, and cable TV. All of the cabins are located within a mile of Burr Oak Lodge where visitors have access to all of the lodge’s amenities such as a playground, tennis courts and an indoor pool. The resort also offers 40 miles of hiking trails as well as hunting, fishing, boating, swimming and two in-house dining options. In addition to all of the outdoor adventures available on-site at Burr Oak Lodge, hikers will love the nearby Sunday Creek Wildlife Area which is part of the larger 6,696-acre Wallace O’Dowd Wildlife Area. The Shawnee Lodge is a collection on Ohio camping cabins located on Shawnee State Forest and Shawnee State Park’s 63,000 acres. This land was the hunting grounds of the Shawnee Indians and has been dubbed “Ohio’s Little Smokies.” Discover the place for yourself in one of the center’s 25 family cabins. The cabins sleep up to six people and have two bedrooms, a bathroom with a shower, a living room and kitchen, a gas log fireplace, a screened porch, fire ring and charcoal grill. Four of the cabins are pet-friendly. There’s so much to do at Shawnee Lodge, you’ll be hard-pressed to do it all before you leave. The lodge offers an indoor pool and hot tub, disc golf, a playground, golfing, geocaching and hiking trails. The 60-mile Shawnee backpack trail in the nearby Shawnee State Park takes hikers to some of the best wilderness areas in Ohio. The forest also has 75 miles of bridle trails. Birders will enjoy the Appalachian Discovery Birding Trail. Visitors have seen bald eagles, ospreys, yellow-crowned night heron, horned lark and the uncommon cerulean warbler. Kim Dinan is an author and adventurer. Endlessly curious about the world, she has backpacked to over twenty-five countries on five continents and has called India, Mexico and numerous campgrounds around the USA home. Her love of the outdoors landed her a coveted job on Backpacker Magazine’s Get Out More Tour and has compelled her to climb mountains in the Himalayas, raft frigid rivers in Patagonia, and walk five hundred and fifty miles across Spain on her own. She lives in the mountains of Western North Carolina with her family.